Mr. Georgiadis (lower left) with members of the AHI Board of Directors. WASHINGTON, DC —The American Hellenic Institute (AHI) hosted a private dinner for Adonis Georgiadis, who is the vice president for New Democracy Party, September 26, 2018 at the Kingbird Restaurant, Watergate Hotel. According to AHI President Nick Larigakis, the dinner focused on informing Vice President Georgiadis on the current work of the American Hellenic Institute to help advocate for U.S. relations with Greece and Cyprus, and included a discussion on other areas of mutual interest. “We appreciated the opportunity to host Mr. Georgiadis during his visit to Washington,” he said. In addition to Mr. Georgiadis and AHI President Larigakis, AHI Board Members Dr. Athina Balta, Esq., Nicholas G. Karambelas, Esq. ; and James L. Marketos, Esq., attended the dinner. Col. Vasileios Lampropoulos (left) with Nick Larigakis. 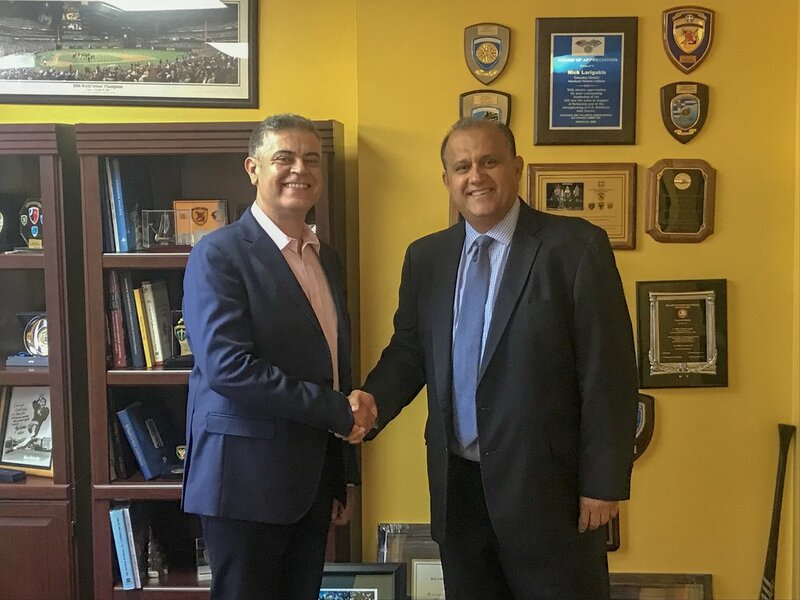 WASHINGTON, DC —The American Hellenic Institute (AHI) welcomed Colonel Vasileios Lampropoulos, the Embassy of Greece’s new defense attaché, Hellenic House. The discussion also focused on a how AHI keeps the broader policy issues impacting Greece on the agenda of policymakers and how AHI works on initiatives that serve to strengthen U.S. relations with Greece. On defense cooperation, the discussion centered more on Greece’s military capabilities and the contributions of NSA Souda Bay to national security interests.